As you may have noticed, I'm back from my vacation... I feel like I was away forever, as the weather has changed a lot, flowers have bloomed, the days are longer, and there are just lots of things I have to readjust to now that I'm back in NYC after almost 2 weeks in New Zealand. I flew there via Los Angeles and Sydney-- I was very glad that I took the Economy Plus seat upgrade that cost me $119, as that is a very long trip. United charges for the extra leg room on international flights, but on the JFK-LAX leg, the whole plane was Economy Plus-- that is, except for business and first class, which took up a much larger than usual percentage of the plane. I guess a lot of people go for the more expensive seats on this route, and even for those who don't, the extra space in economy is popular. While in JFK, I bought a couple of little NY teddy bears as gifts for the children of some friends I'd be seeing in NZ, for about $8 each. On the plane to LAX, I bought a $5 boxed meal-- I'm actually glad that airlines are now charging for food on domestic flights, as the quality of the meals is much better than what you used to get for free. At LAX, I bought some chocolates and cigarettes, again as gifts for friends in NZ, totalling about $45. I also bought a book (about $15), as I had already demolished almost 2 entire books and a magazine and was worried I'd run out of reading material! When I arrived in Sydney, I had a dilemma. I only had a couple of hours to kill between flights, but after that long journey, I was dying for a cup of coffee. 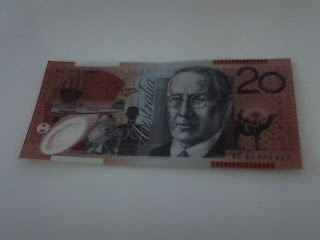 It seemed silly to get Australian money just for a cup of coffee. But the cafes all seemed to have a minimum for credit cards and I didn't want any other food, especially since NZ has really strict biosecurity and they're picky about what you can bring in: no fruit, honey, meat, etc. I ended up getting $20 out of an ATM, and buying a couple more small gifts with some of it, but I still have $6.80 left over. I wish I'd had more time so I could actually have stayed over in Sydney and seen some of the place, but I'm sure I'll have a chance to go back some day. From Sydney, I continued to Christchurch, where my sweetie, who had traveled from elsewhere, met me at the airport. 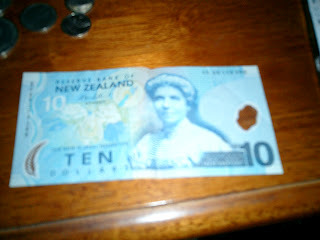 I was so happy that I'd finally arrived that I didn't realize until we got to our hotel that I hadn't gotten any New Zealand money! I had a few dollars left over from my last trip, but it turned out that most of my coins were no longer usable. In the 3 years since I last visited, NZ has eliminated 5 cent coins, and changed some of the larger coins like 50s and 10s to different sizes. 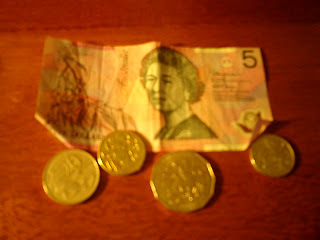 (I think they had already done away with 1 cent coins a while ago, and NZ's paper money remains the same, with $5 being the smallest denomination.) All prices are now rounded to even 10 cent increments, which I think makes a lot of sense. I wonder when the US will get its act together to do this! But one interesting thing I noticed just now was that some of my credit card receipts show prices that are not rounded-- I guess if you really wanted to pinch a few pennies, you could pay with cash when the price needs to be rounded down, and pay with a credit card to stick with an exact cost that would otherwise be rounded up! I like how both Australian and NZ bills have these little see-through inserts, seen above on the right side just above the number 10. They are slightly textured, and I'm sure make forgery a lot more difficult. After checking into our hotel, we went out for dinner at a cafe/bookstore where there was a poetry reading-- one of the poets was American, and read a piece that happened to be about staring at Abe Lincoln on the $5 bill while sitting in an airport cafe, which I thought was kind of funny. The next morning, I took a walk to a cash machine and took out $200. Then I went to a cafe to get some breakfast. Coffee is relatively cheap in NZ-- I found that a large latte tends to be about $3.50, which when you do the exchange works out to less than you'd pay in most places in the US. But it seemed weird that a bagel with cream cheese and jelly was $5, which works out to almost US$4. I was also not too happy at the fact that the bagel was toasted on a sandwich press which obviously hadn't been cleaned too thoroughly since something with pesto had been on it. And then the whole melty, cream-cheesy, strawberry-and-pesto flavored mess was just shoved in a paper bag instead of being wrapped in paper. Anyway, I am not really one of these people who misses the point of travel by complaining that everything isn't the way you can get it at home, so for future breakfasts I took advantage of the superior scones and crumpets available in NZ. Before leaving Christchurch, we availed ourselves of another good thing that comes cheap in NZ-- a nice big swimming pool. The public swimming pools there are nicer than many private ones in the US. The locker room facilities might be more spartan, but it's wonderful to be able to walk in a take a swim for only a few dollars, and it seems less prevalent for people to join private health clubs at all, unlike here in NYC where it can be fairly difficult for a traveler to go swimming for less than $20 a dunk. I didn't take any photos in Christchurch, as I'd been there before and though it's a neat little city, this time it was merely a starting point for the real adventure: getting on the road and doing a mini tour of some of the South Island's best hiking! Tomorrow I'll tell you more about the rest of the trip, with plenty of photos of spectacular scenery. I promise they'll be of better quality than my currency close-ups! I liked the photos of the currency. You probably could have bought your coffee in Sydney with some NZ coins. They're so similar in shape and value that Australians usually accept them. In Aus cash prices are rounded to the nearest 5 cents (unless they have dropped 5 cents too since 2002?). Credit cards, cheques etc. have the price down to single cents. I really don't know why the US doesn't get rid of the one cent coin. Bagels with cream cheese are very cheap in the US compared to other sorts of sandwiches. Bizarrely cheap actually, don't you think? Bronx Chica...great to have you back in the Us safely! I had a weekend trip to see relatives. It was all about- going to thw army base, shopping, making a towel cake, and going to the shooting range. My weekend was all about fun and it sure was! Not any more, "An Australian". The new NZ coins are too different. But I guess the old ones might have passed. I just wanted to comment on the swimming pool: NZ swimming pools might be cheap, but they have a bit of an "ick" factor. Lately Christchurch in particular has been having trouble with kids pooing in the pool: several times a day, in fact (apparently they do it because if the pool has to be closed for sanitation, they get a refund on their entry fee). I was just reading about it in one of the local papers. It's put me off going there for life! There are also cheap swimming pools in the US. In Austin, Texas, for example, I think they are mostly $2 per day. That is still more expensive for you than $20 in New York, once you factor in the commute! But I always like how I discover things on my travels and then find that some of them are in my own back yard as well. I was glad when they changed the coins in NZ. 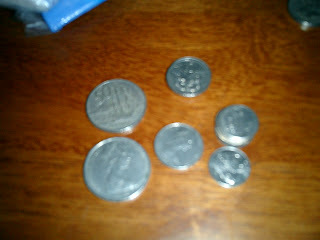 The 50c pieces were enormous, and the 5c coins were useless. We haven't had 1-2c for over 10 years. Does the US have similar plans to dismiss the nickel?